A cyberattack that took down large swaths of the internet around the world on Friday was carried out, in part, by unsuspecting devices connected to the internet. Security firm Flashpoint said it believes that digital video recorders and webcams in people's homes were taken over by malware and then, without owners' knowledge, used to help execute the massive cyberattack. 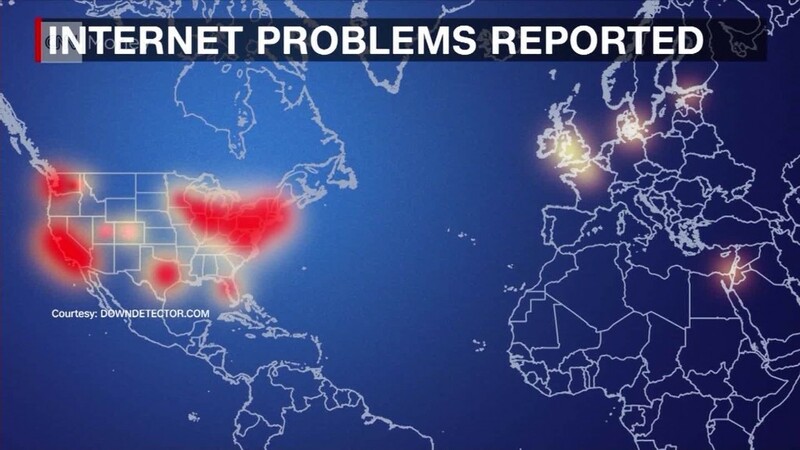 As a result, throughout the day Friday many users were unable to connect to popular platforms like Twitter, Netflix, Spotify and the Financial Times in various parts of the U.S. and Europe -- mainly the American northeast and the U.K.
"It's too soon to know," Doug Madory, a director at Dyn told CNNMoney. The methods used in Friday's attack were very similar to the one carried out against the website of cyber researcher Brian Krebs last month, as well as French internet service provider OVH, according to Flashpoint. It's unknown if the attacks are related. Friday's cyber-blitz demonstrated just how vulnerable the internet's infrastructure is to these type of bombardments. -- CNN's Jim Sciutto, Sara O'Brien and Julia Horowitz contributed reporting.